Today has been tough finishing with a 10km run over a hilly route out of La Santa. I could just about hold a 4:45 minute per kilometre pace. Whilst this is hardly PB territory and might make you wonder why I’d be writing about rebuilding my run when I was struggling to keep my friend Roger in sight it’s what’s gone in the weeks before that’s important. I had some excellent run form around the time of Challenge Roth, Ironman UK and also Kona, but since October there’s been a definite dip. Run performances dropped off and the perceived effort for my pace was way higher than it had been. The cause was a combination of racing heavier and of running less in training. My desire to emphasise the bike keeping me far too tired to really do good work on the run! 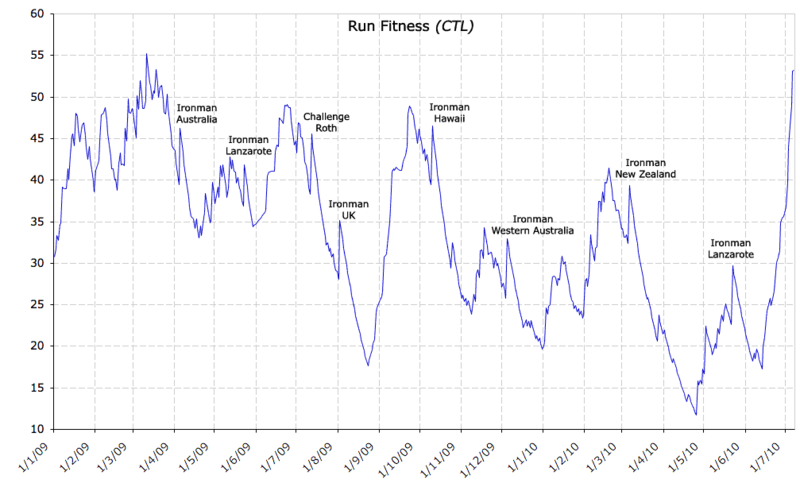 The past year and a half of run data in WKO+ shows a real roller coaster of fitness (CTL) on the run. 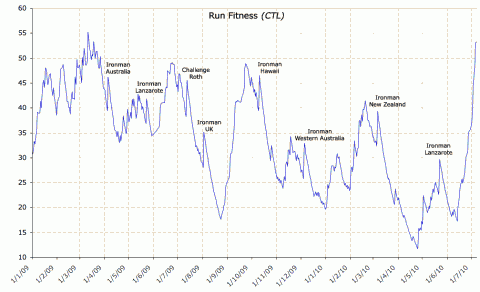 The graph above charts my run CTL since January 2009 which I started with some of my highest ever run fitness. I was running a lot at that point, but probably biking a little too easily. I’d do weeks where I’d run off every bike starting with 15 minutes a session and building up to 45 minutes. Combined with regular run training the volume soon added up. Despite this I had a shocker at Ironman Australia due to a badly managed taper combined with far too much weight. That run hurt. I remember being out there on the course and spectators cheering me on telling me I’d be finishing in under 10 hours. Whilst that would probably make most people happy I felt like saying I’ve been there plenty of times before! As you probably know Lanzarote never gave me the option to test out run form. Thanks to the abscess the whole race was a bizarre and painful experience. Completely different to the usual discomfort I go through it was about surviving. I suspect even without an injury I was too heavy to really run well. The three good runs of 2009 came off the back of a concerted effort to achieve optimal race weight and to careful build run form. The primary strategy to achieve improvements in running was simply a game of running a minimum of thirty minutes a day. With good diet dealing with the weight issue I quickly found myself running better than I had in a long time. The regularity of the training combined with a few longer and harder sessions was enough to strengthen my run. Since Hawaii I’ve struggled to return to that good run form or race weight. Possibly due to a need for more recovery than I allowed, but also a conscious choice to really work on the bike. A decision I made on the basis that my run was pretty good and there was greater margins to gain on the bike. Just look at the drop in run CTL in the chart, massive! I was running far less than I’d done in the previous year of training and unsurprisingly the next two races, Western Australia and New Zealand, had what I felt were at best painful, mediocre runs. Performance relative to the field wasn’t bad, but was certainly off what I think I can achieve. Moving on from the history lesson this year’s run in Lanzarote doesn’t bear much thinking of. Slow and once again painful thanks to too little to late on the training side (the five week lay off) and also to lumbering myself with some extra kilos again. I wasn’t in great shape for that race that’s for sure. Having realised I can’t rest on my laurels if I want to perform well in Kona it was time for change. My bike has become stronger from past few months of focus which means it’s time for it to go into more of a maintenance mode. I’ve started my Kona build with a very strong run focus and determination to go to Hawaii in the best run form of my life. Having been inspired by an Arthur Lydiard biography whilst in New Zealand I’ve adopted many of the features of his approach. Admittedly it wasn’t designed with triathletes in mind (we weren’t around) so there’s some adaptations to be made. The core principles are sound though and the main thing to hold in mind is that swimming and biking provides a lot of the additional aerobic conditioning Lydiard encouraged. Despite that I like a challenge so one of my goals is a 100 mile run week the number of miles Lydiard generally had his runners train. I wouldn’t say it was essential in fact far from it, but the process of building myself to that volume involves plenty of running which has to be a good thing. I’m only a week away now. I’ve made massive progress in the past few weeks helped by losing some of Lanza’s excess kilos. Volume has been high, but it’s not meant a significant drop off in quality. Sure if you looked at today’s session you might think things weren’t going well, but you should take into account I’d run 130km in the previous six days including a 1:34 hilly half-marathon the day before. I’m regularly surprising myself with faster run times and better performances than I’d expect. The volume of running I’ve undertaken has clearly been of benefit. My previous Ironman pace feels so easy right now and I can click along at that for hours every day. Scroll back up and look at the graph and you’ll see there’s a huge spike in my run fitness (CTL) these past few weeks. A consistent, heavy build period has brought me back to that fitness of early 2009. Despite the rapid increase I seem to be holding up well and am able to back up with strong workouts in all disciplines. All that said I took the discomfort of today’s run as a sign I was reaching the limit of overload and need to hold back for a couple of days. It fits perfectly with having to fly back to the UK, but will mean a little more work at the weekend to get to my goal of 130km this week. Then it’s onwards to 100 miles we’ll see how that goes at the end of next week.